I'm on a real popcorn kick at the moment - I've always loved it but I can't get enough of it recently! I'm particularly loving sweet & salty popcorn which may not be the 'healthiest' of choices but hey, I like it and a little treat every now and then never hurt anybody! 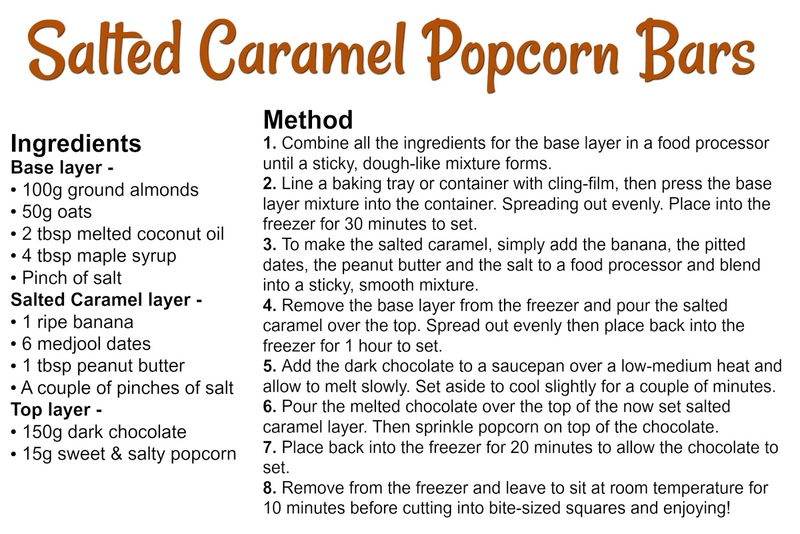 I decided to get creative and incorporate my favourite sweet & salty popcorn into an indulgent but healthier sweet treat, and I'm telling you now....it's AMAZING! 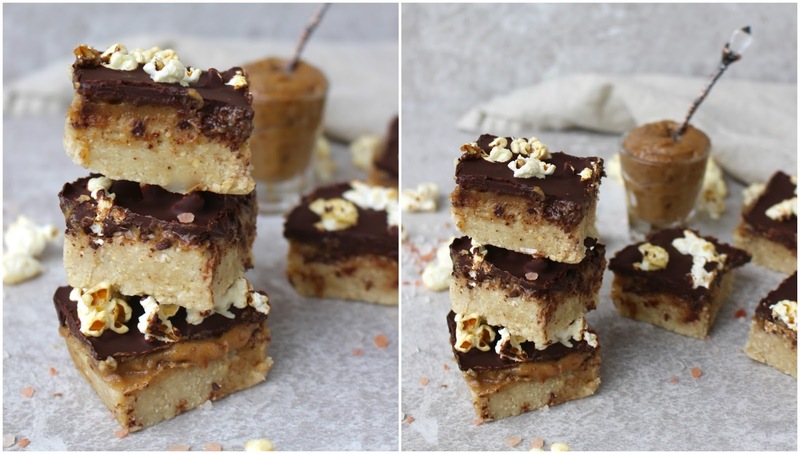 Introducing Salted Caramel Popcorn bars! These little bars of heaven are simply divine. 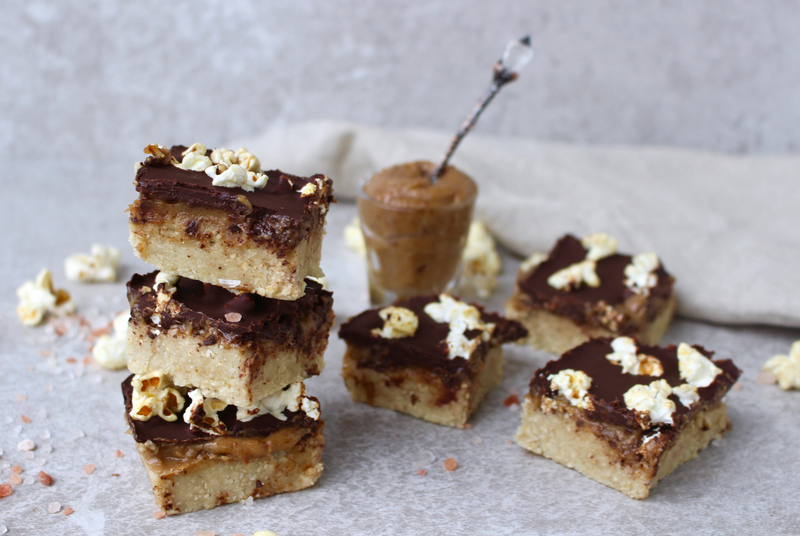 They're like millionaire shortbread but a million times better, and they're even gluten free, suitable for vegans AND refined sugar free (bar the popcorn on the top....you could always use plain or just salted popcorn to change this but I really like the Propercorn Sweet & Salty flavour in this recipe). The base is biscuity and made out of ground almonds, oats, coconut oil and maple syrup, the caramel layer couldn't be more delicious but couldn't be easier to make - it's simply a banana, some medjool dates, a little peanut butter and some salt blended together, then the bars are topped with a layer of dark chocolate and of course, the all important popcorn.